LAKEWOOD, NJ - Shore Town Baseball, a newly formed group headed by Minor League Baseball veteran Art Matin, and including local investors Bob Tamashunas and Bill Luby, both residents of Monmouth County, NJ, has reached an agreement to acquire the operating interest in the BlueClaws. Matin was previously the CEO of Mandalay Baseball Properties, which owned and operated nine separate franchises over its existence, including among others the Dayton Dragons, Oklahoma City RedHawks, Frisco RoughRiders, and Scranton Wilkes-Barre RailRiders. This followed a successful career in the tech industry that included senior positions at IBM, McAfee Security, and Veritas. He also served as chairman of MiLB's Baseball Internet Rights Company (BIRCO) from 2010-2014. Luby and Tamashunas are partners at Seaport Capital, a private equity firm that has a history of investing in minor league baseball through its majority ownership of Mandalay Baseball Properties. "This opportunity with the BlueClaws is certainly very exciting for all of us," said Matin. "Our ownership group is made up of people who love the game of baseball, have extensive experience in owning minor league baseball franchises, and bring local knowledge and commitment to the table. We look forward to continuing the tradition of providing fun family entertainment and exciting professional baseball for decades to come here on the Jersey Shore. I have always admired the previous BlueClaws ownership group and thank them for working with us on this opportunity and congratulate them on 17 terrific seasons with the team." Matin added, "The BlueClaws are an established and successful franchise with a talented and committed staff. We look forward to working together to identify ways we can make an already excellent fan experience even better. We also look forward to continuing the BlueClaws tradition of being a strong partner in the community. We're excited to hear from our fans and learn what they like most about coming to BlueClaws games." Tamashunas said, "I am especially excited as a Jersey Shore resident and lifelong Phillies fan to be part of this ownership group with the BlueClaws. I know full well that the BlueClaws are a great asset for the Jersey Shore community and look forward to our fans and partners enjoying the BlueClaws experience in the coming years." The BlueClaws, who played their inaugural season in 2001, will welcome their seven-millionth fan through the gates at FirstEnergy Park at their next home game on July 27. The club has led the South Atlantic League in average or overall attendance in each of the past 16 seasons. "Our nearly two decades with the BlueClaws were gratifying and enjoyable in every way," said Joe Finley of American Baseball Ventures, the team's outgoing ownership group. 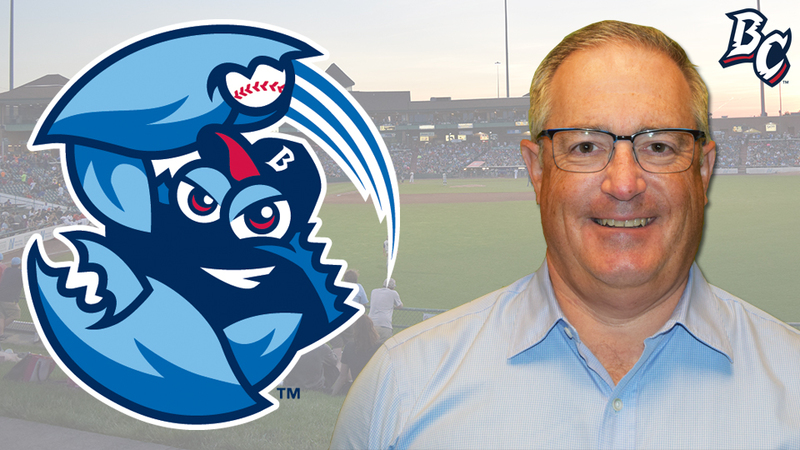 "I've known Art Matin for a decade, and with the new ownership group and the talented team of people on the staff, the BlueClaws are in very capable hands. We wish the team, fans, and sponsors nothing but the best." The BlueClaws, a Philadelphia Phillies affiliate since their inception in 2001, will remain with the Phillies. The two organizations signed a new Player Development Contract last year that runs at least through the 2020 season. Phillies President Andy MacPhail commented, "We are thrilled to welcome Art, Bob, Bill and Shore Town Baseball to the Phillies family. Their passion for the game is outstanding, and we know they will do a great job leading the BlueClaws and supporting the Phillies, our young players, and coaches. I'd also like to thank Joe Finley and the rest of the outgoing ownership group for 17 great years together in Lakewood. We would also like to express our appreciation to all the fans who have supported the team over the years." The BlueClaws are the Jersey Shore's top stop for affordable entertainment. Tickets for all remaining 2017 BlueClaws home games are available by calling 732-901-7000 option 2 or online at BlueClaws.com/Tickets.